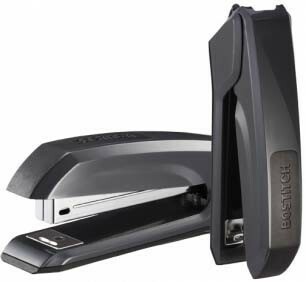 [0-77914-05808-3] This ergonomically, chic designed desktop stapler brings a fresh new style to your desk, especially with its added shiny gloss accent. Featuring an integrated StapleStore™ compartment for keeping two extra strips of staples close at hand and a built in staple remover for convenient removal of staples. Staples up to 20 sheets with standard staples. Ascend™ can be effortlessly opened 180° for tacking and craft use. It is Antimicrobial protected and prepared with a non-skid base for stability and desktop protection. 70% post-consumer recycled content.